I know this has nothing to do with irises, but we have had such a good reaction from our past stories that we made a page just for the birds and animals that visit or call Cascadia Iris Gardens home. 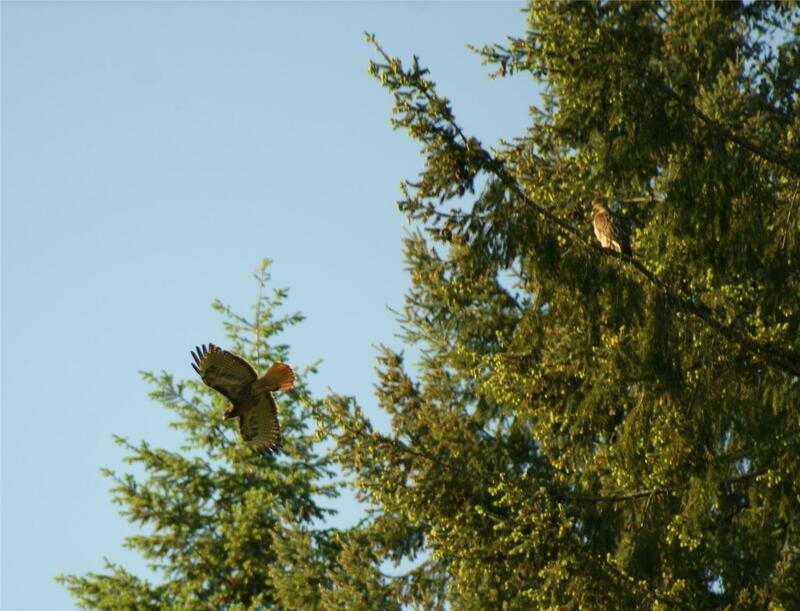 My favorite story is our pair of Red Tailed Hawks. However, our story has taken a sad turn. Due to either clearing too much land for irises, or placing the chicken coop directly under their nest, our hawks have moved to the next property over. They still come for visits and do keep our bunny population to a minimum, but we only get to enjoy the babies from afar. Perhaps they will come back some day. Our resident killdeer had another good year with three clutches of babies. The parents have resigned themselves to sharing garden space with me (not so much with Margaret); they hardly raise a ruckus as I meander by their nest. That is until hatching day, when they go full on drama queens. Unfortunately for them, this alerts me to the fact that the babies have just hatched. All I need to do then is get Margaret out with the camera and we get excellent photos of the new babies. Our hummingbirds have Margaret trained to perfection. They have her maintaining six different feeders and don’t hesitate to express their frustration when any of the feeders are empty. 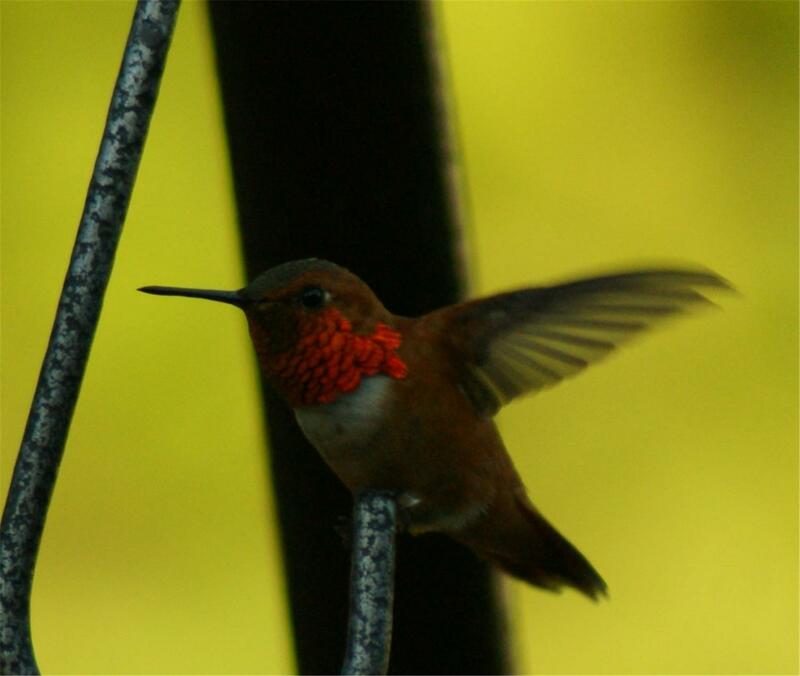 We think we have as many as 10 of the resident Anna’s Hummingbirds that call CIG home. During the summer we get an influx of the migratory Rufous hummers. It is during this time you need to be particularly careful around the feeders. They are constantly fighting each other for dominion over the different feeders. You certainly do not want to get between them. Our population of Mourning Doves has really grown. Several years ago we adopted our first pair. Well, they simply moved in and expected us to feed them. Now I feed them daily, and our population swells to around 30 near the end of summer. They are not shy and will hang around the house and feeders as long as we don’t startle them. We can scare away our neighbor’s pigeons and the doves will remain to enjoy the feed we put out for them. When they’re not around the feeders, they tend to hang out in the tall grass, presumably enjoying the grass and weed seed. While there, they seem to revel in waiting until we are right on top of them before taking flight, scaring the bejeezus out of all who wander by. It happens all too often, proving that the term “mourning” does indeed reference their lonesome call and not their sense of humor. Strangely enough, one of the main reasons Margaret and I bought the property were the two hills of thatching ants, Formica obscuripes. The gentleman we bought the property from had long been trying to poison them. Fortunately he was either inept, or the ants are as hard to kill as cockroaches. Either way, the ants have persevered. Both hills are alive, active, and growing, and we fenced them to create mini-sanctuaries. Moreover, we have discovered a third hill and will be fencing this one in as well. We consider these a beneficial insect as they harvest aphids and keep our slug population to a minimum. as a nice fresh treat for our little friends to enjoy. Not long after, a pair of black-tailed deer came in to enjoy them. So now I get to figure out how to keep them from dining on the choicer plants in our display garden (deer will not eat irises). Our first 5 five years on the property, the deer didn’t wander in. Now, thanks to Margaret, they have become regular visitors. Well, it probably has everything to do with all of the fencing I have removed, but that’s no reason to let Margaret off the hook. Margaret is particularly enamored with our woodpeckers. So much so, she convinced me to purchase woodpecker flavored suet cakes. Ridiculous as it sounded to me, I am ALWAYS the good husband and did as she wished, preparing to console her when they did not come to visit. Mere minutes after I put the first suet cake up, a Northern Flicker came to visit. It’s a good thing I didn’t say out loud how ridiculous her idea was. Since then we have seen four species of woodpecker at the suet feeder. We also get the pleasure of the males using our roof vents or chimney pipe for their very loud mating rituals each spring. Our field guide says they eat fruit and nectar, but we never expected her to feed from a hummingbrd feeder. Must be a young one. She has not learned the futility of searching for bugs in treated lumber. One of 4 species of woodpecker we have here. Keeping the bunnies out of the irises! It is exciting to watch mom amd dad teach the babies to fly! She likes to sit here while guarding her feeder from all who would invade her territory. Okay... Proof Margaret was right. Saying that only hurt a little. When they migrate through, it is dangerous to walk out the door! 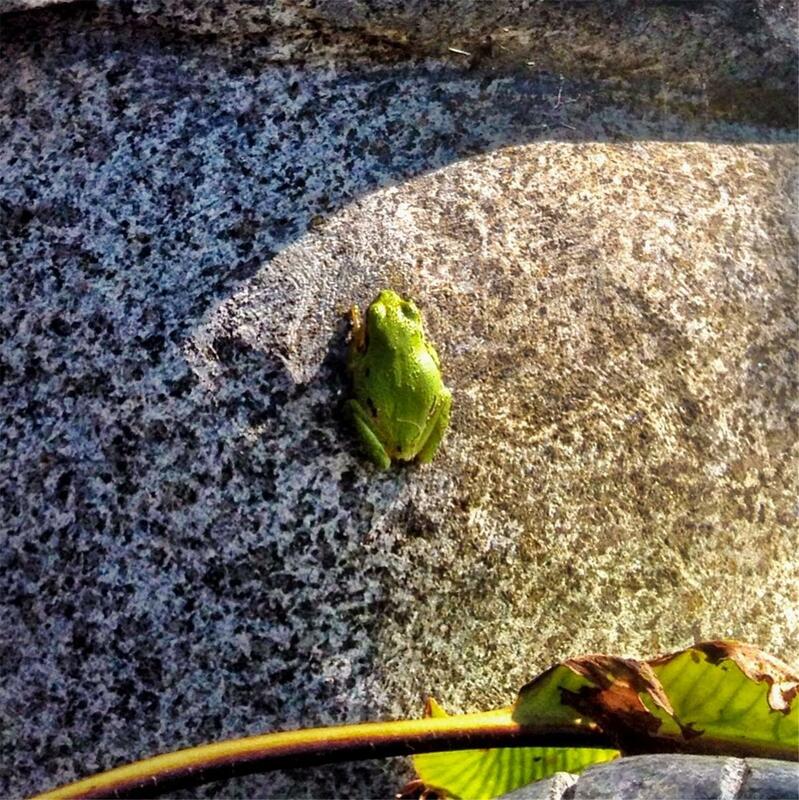 Margaret is never satisfied until she finds a frog to photograph! Mother and son. We did not have the camera when dad walked through. Mom showing her funny face. Dining on Patrick's choicest plants. Two Turtle Doves and a partridge in a... Sorry! Couldn't help myself. Raucus and loud. You always know where they are! Notice how well they blend in. Moments after they hatched. Within hours, they will be completely mobile. 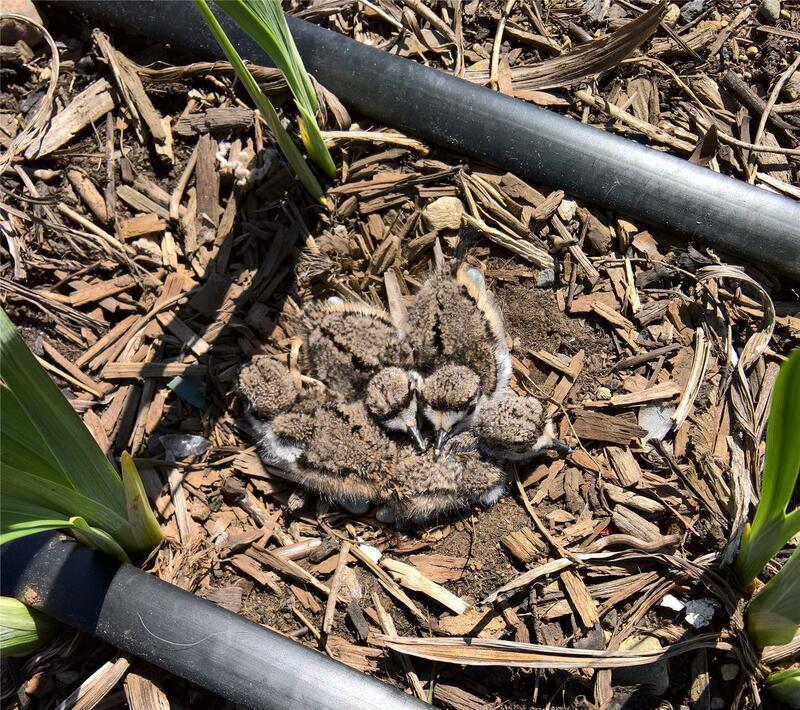 Notice how they like to nest in the iris rows. We will continue to update as new events happen and Margaret takes more spectacular pictures. "I have purchased Japanese Iris from Cascadia Iris Gardens for the past 3 years. I have always received very healthy iris, whether I purchased them spring or fall. I have never been disappointed. That is why I always come back. I am looking forward to seeing their 2018 selection." © 2019 Cascadia Iris Gardens. All Rights Reserved.